Have you seen the movie, “Christmas with the Kranks”? It is hilarious! With their only daughter away with the Peace Corps over Christmas, Luther and Nora Krank decide to “skip” Christmas and go away on a cruise. Their decision to boycott the holiday has the neighborhood in an uproar. This movie is hilarious because it is so relate-able! I can identify with all of the crazy details that we can get caught up in over Christmas- the cards, decorations, parties, lights….losing sight of WHAT Christmas is really about. Sometimes we can become so overwhelmed with the activities, forgetting that Christmas is remembering and celebrating the birth of Christ. One of my favorite Christmas traditions that I got from the book, "Redeeming the Season,"
is called “Gift with Purchase.” Our family spends some time together making simple crafts, like ornaments or jewelry. 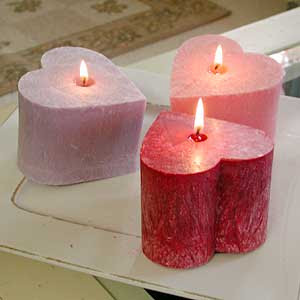 We make several, usually at least 10-20 items. Then, when we are shopping, we give them to sales clerks, thanking them for working during the holidays. We make sure to include a scripture and message of God’s love through the birth of Jesus. The reaction of surprise and thankfulness of the clerks is so worth the effort! They love being appreciated. You don't have to be like the Kranks and try to "escape" all of the hub-ub by "skipping Christmas", but stay grounded on why we are celebrating- the birth of our Lord and Savior, Jesus Christ. I had been reading some of my original blog posts and found this gem from 2007. Love it! Last night I wasn’t feeling well. In fact, our whole family is fighting off a “bug.” So, with homework finished early and supper done, we left the dishes in the sink and all got under some blankets to “snuggle buggle” and watch a movie. Lying there next to Ashley, my precious 8yr old, she looked up at me and said, “You are so beautiful, Mama.” She outlined my features and continued, “More beautiful than Miley (aka “Hannaha Montana”) or Mary Jane (Parker from Spiderman).” Now this surprised me, because I had not a stitch of make-up on and my hair was pulled back into a ponytail. (Not exactly “movie star” material!) I hugged her closer and giggled and we continued watching the movie. But, as I was out walking this morning, God brought back that moment to my memory. What made me so beautiful to my little girl? It wasn’t the make-up or the hair or a gorgeous outfit. One of the verses I purpose in my heart to “live out” is 1Peter 3:3-4. It is my hearts’ cry that “my beauty should not come from outward adornment….Instead it should be that of your inner self, the unfading beauty of a GENTLE and QUIET spirit, which is of great worth in God’s sight.” Gentle….a fruit of the spirit. How I long that I am gentle. That my talk is gentle (a gentle answer turns away wrath). Other words for gentle are calm, kind, and tender. I always want to be tender to my family. And, “quiet.” I look at quiet as resting in God, trusting Him. A quiet spirit…….a humble spirit…..
Father, may this be a gentle reminder to all of us that true beauty comes from a spirit who loves, follows, and trusts You. There is nothing more beautiful than a reflection of Your glorious Light. Help us, as women, Lord, to be secure and comfortable in who You have created us to be. Father, we praise You and love You. Glory to God in the highest! In Jesus’ Name we pray. Amen. During my time in Tuscan, I had a couple of days on my own while Brian worked. There was an amazing hiking trail adjacent to our hotel and Brian and I had hiked part of it together. On my first free day, a friend from the conference and I ventured out on the trail. I had been on it once already and was able to lead us further than where I had been. On my second free day, God called me out into this wilderness trail to be alone with Him. Now, I was a little more than nervous doing this, especially since I had seen a (dead) rattlesnake the day before when I was out walking. I knew the trail was pretty challenging and a bit treacherous at times with streams to ford, rocks to climb, and plenty of wildlife to be wary of. But, if God was calling me out, I knew He would protect me. It didn't take long for me to understand that I was going to have to face my fears. The biggest fear for me was that of the unknown. I literally trembled as I had to walk through jungles of overgrown brush or when the the trail narrowed and I had to creep closely to the canyon walls. I was petrified that something hidden would come out and hurt me. Being alone was so much harder than with a hiking buddy. Every little noise put me on edge and I had to continue to call out to God and depend on Him. Over and over I asked Him to give me courage to continue. God continued to push me farther, to challenge myself to do more than what I thought I could. He encouraged me over and over to face my fears and keep going. When I sat down on a boulder near a stream, I soaked in His sunshine, His beauty, His peace....A beautiful butterfly was my constant companion. I continued to feel stronger and the more I pushed in, I felt more brave. During life, God calls into the wilderness at times. He pushes us deeper...further. He asks us to face our fears and join Him near the streams for refreshment. He teaches us lessons that can only be learned in the wilderness. During my experience, He revealed things in my heart that need to change. He drew me closer still to Him. He proved Himself a trustworthy guide. Some lessons I learned were that shortcuts, although they may appear to be shorter can be dangerous. The trail may take longer, but it is the safe path. I met several other hikers along the way. Most were small groups, but some were alone like me. Now, I am often a bit wary of strangers when I am alone and in an isolated place, but I found a co artery and unity with my fellow travelers. We were all facing these same struggles....the same streams to ford, boulders to climb, narrow trails to navigate. We ask one another what the trail was like ahead and how far we had gotten. We had the same struggles, but also the same desire and goal to reach the maiden pools. In life, we need a community of others to encourage each other. Going up the trail can be physically demanding, climbing up rocks and canyons. But, coming down isn't always "easier". The momentum can bring you down too quickly. I had to use muscles and energy to slow myself at times. Jumping down can be more perilous than hoisting myself up. I am thankful for my wilderness time. I felt so accomplished and victorious when I finished! God showed me that I am much more brave than I had imagined. He helped me face my fears. My favorite time is still sitting near the quiet stream, soaking Him in and allowing Him to fill me with His Presence. I encourage you to take some time alone with Him in the wilderness. Thank you Lord for your love. Thank you Lord that you encourage us to spend time with you alone in the wilderness and that you challenge us to face our fears. Thank you for providing community to encourage us. Thank you for quiet rests. I love You Lord. In Jesus Name I pray. Amen. Paul experienced quite a STORM in Acts 27. This storm was so violent, it shipwrecked Paul and the entire crew, landing them on the island of Malta. The coolest thing God showed me though, is that He USED Paul's storm and being shipwrecked on Malta for His glory....leading the people of Malta to become followers of Christ. God will use our storms (when we allow Him) and turn them into "Malta-s", opportunities to WITNESS and share God's love with others. Jesus also experienced storms....and His disciples. In fact, they often experienced the storms WITH Jesus. Jesus had told the disciples that they were going over to the other side of the lake. They all climbed into the boat and began to cross to the lake. During the sail over, Jesus fell asleep. During this time, a huge storm comes up. "The boat was being swamped, and they were in GREAT DANGER." OK, these guys were fishermen- they were used to life on the sea. They had undoubtedly seen many storms. But this one SCARED them! They woke up Jesus screaming, "Master, Master, we're going to drown!" They are hysterical. They thought it was "all over." Now, I had always "read" this as the disciples were waking up Jesus to have him DO SOMETHING. But, perhaps, they are waking Jesus up because they think they are going to have to jump ship....that this storm is "IT"....this is the end for all of them.... Are they waking Him up, thinking "How can you sleep through THIS? We are all going to die!" He got up and rebuked the wind and the raging waters; the storm subsided, and all was calm. "Where is your faith?" He asked His disciples. In fear and amazement, they asked one another, "Who is this? 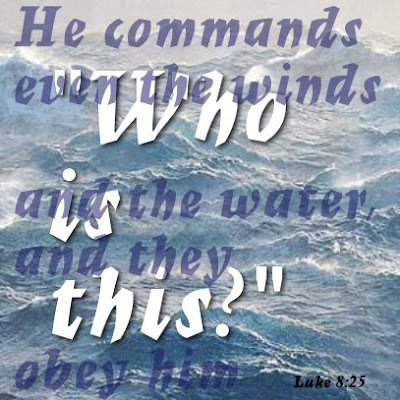 He commands even the winds and the water, and they obey Him." If the disciples had known that Jesus was GOD, would they have been scared? If they knew that I AM was in the boat with them, would they have feared? God Almighty...Creator of the universe...Who set the stars in place....Who created the sea.....Who keeps the winds in storehouses.... was with them in the boat! If they realized WHO Jesus was, would they have panicked? Peter had not yet confessed that Jesus was the Christ. And, although they knew Jesus was something NEW....a prophet, a teacher, something very special.....did they know that GOD Himself was in the boat with them???? If they did, would they have been afraid? And, it made me think of myself. If I truly believed that the great I AM, the God of the universe, the Creator of heaven and earth, the Almighty were in MY boat, would I be afraid when the storms of life come up? When temptations come, when trials come....do I see WHO IS IN MY BOAT WITH ME? Do I relax in faith? Do I trust? Do I rest in knowing that in my time of need, the Lord Himself is there, in MY BOAT, as my strength, my Savior, my sufficiency? Lord, help me to see You for Who You are. You are the Creator of the UNIVERSE! You have created all the stars, the seas, the creatures... You made ME. Give me eyes to SEE You for who You are. You are the great I AM! When the storms of life come up, help me to trust completely in You, knowing that You can calm them with just a word. You are in MY BOAT WITH ME. Help me to get a revelation of that. I love You, Lord! Praise You, Jesus! Thank You for Your glorious Word! In Christ, the Calmer of the Storms, the One, True, Living God's Name we pray. Amen!